The venerable phrase, “common sense,” has taken a beating, thanks to the School Nutrition Association (SNA), which is descending on Capitol Hill this week to convince Congress to roll back school nutrition standards. The organization has been regularly tossing out the phrase “common sense changes” to rationalize its call to gut the evidence-based 2010 Healthy Hunger Free Kids Act (HHFKA). In other words, SNA, and its industry sponsors, believe that good judgment calls for walking back healthy school nutrition standards, which were implemented to help halt the deadly epidemics of childhood obesity and Type 2 diabetes. SNA Ask: End the requirement that every student must take a ½ cup fruit or vegetable with every reimbursable school meal. Why this is a terrible idea: Do parents allow children to skip their bath, refuse to do their homework or blow off a curfew? Allowing kids to refuse a fruit/vegetable with their school meal is anything but common sense. It’s irresponsible, damaging to their long-term health and will undermine the HHFKA nutrition standards. For those in Congress cringing at the thought of increasing the current school meal reimbursement rate, a recent brief found that obesity-related expenses cost the federal government $91.6 billion yearly through Medicare and Medicaid. Bring back unhealthy school meals and they can become part of the problem again. Why not pay a little bit more now for healthier school food so that the government pays less through the public health insurances? In addition, the SNA should throw its muscle behind Senators Susan Collins and Heidi Heitkamp’s School Food Modernization Act, which would help schools access modern kitchen equipment as well as training and technical assistance (TA). Many school food professionals need additional skills to prepare and market healthier foods that appeal to students, including fruits and vegetables. SNA Ask: Roll back the current requirement that all grains offered be whole grain rich to the previous requirement that at least half of grains offered be whole grain rich. Why this is a terrible idea: The SNA wants to permanently roll back yet another sensible, evidence-based provision of the HHFKA because of sourcing problems and because kids are slow in transitioning. Increasing kids’ consumption of whole grains is critical to their long-term health and kids raised on refined grains will understandably take time to adjust. Stay the course! What the SNA should really ask for: USDA has already announced that it will offer flexibility to school food programs that are having trouble sourcing palatable, whole grain versions of popular school foods like pasta. This is the type of case by case “common sense flexibility” the SNA should be asking for, not rolling back the entire whole grain provision. SNA ask: Allow any food item permitted to be served as part of a reimbursable meal to be sold at any time as an a la carte item. Why this is a terrible idea: Tempting kids with a la carte foods (competitive foods) is the antithesis of common sense. According to a report from the Food Research and Action Center (FRAC), “… competitive foods drive children away from the school meals programs and particularly lead to decreased participation by students paying full price for school lunch.” Siphoning off revenue from the healthier, reimbursable meal program while luring students, who can pay, with single items like pizza and potatoes would be an economic and health disaster. What the SNA should really ask for: If school food directors were able to make their reimbursable meals more appealing, full-paying participation would increase and schools wouldn’t be looking to a la carte foods to subsidize the cafeteria. SNA should ask for increased per meal reimbursement and the passage of the School Food Modernization Act. 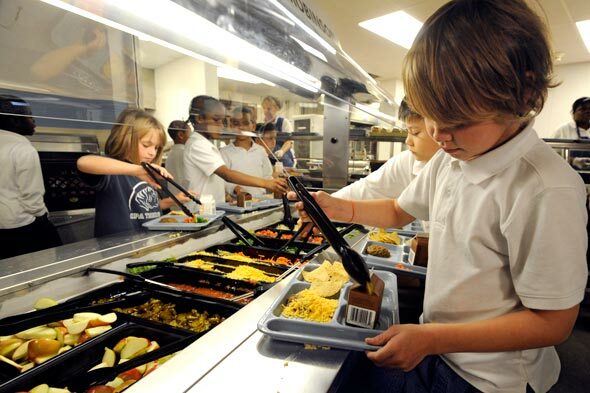 SNA ask: Don’t lower the sodium content of school food any further. Why this is a terrible idea: While the lowering sodium in school food is challenging, we can’t keep sodium content at the current damaging levels. Kids, on average, are consuming daily more than double the amount the American Heart Association recommends. What the SNA should really ask for: SNA’s common sense request should be for a more gradual lowering of sodium content spread over a longer period of time. In addition, more funding for training and TA would help school food personnel learn how to cook successfully with less salt. In fact, for several years, including the years pre-dating the implementation of the new standards, participation has been rising among low-income children and declining among children not eligible for free or reduced-price meals. These trends have persisted since the new standards took effect. There are larger factors at play than the school nutrition standards. Congress, please put our children’s health first by preserving the healthy school nutrition standards. This post first appeared on The Hill.